Are you a Dad? Are you Rad? Are you neither? Well it’s your time. 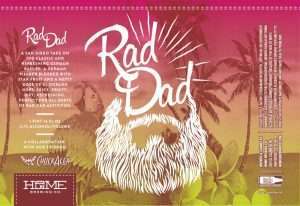 Calling all Rad Dads and awesome humans. We’re celebrating our 6th Anniversary for The Homebrewer and 3rd Anniversary for Home Brewing Co.
To celebrate the good times with our friends ChuckAlek, we present to you this delightfully refreshing German Pilsner blended with Star Fruit and El Dorado hops. This beer is packed with all the juiciness to accompany any of the bad dad jokes. We’ll be playing a special movie selected by our collaborators. To be announced… It will be awesome. We get it Terry, we know how to make a Kleenex dance. Have another sip of this amazing beer and put a little boogie in it. Help us Save the Maris Otter! This wonderfully bready and biscuity malt is fantastic in all styles. We think it works particularly well with Barleywines… So let’s brew some! This competition is open to American and English Barleywine. All level of brewers are encouraged to enter. You will receive complete BJCP feedback from our staff of trained judges. It’s a great way to sharpen your skills and get some pointers for how to make your favorite hobby even more rewarding. 2x12oz Amber Bottles w/ no special markings, and all labeling removed.